Servo Positive Displacement Pump Fillers have their place in the filling world. Positive Displacement Pump Fillers can fill faster than piston filler because there is no recharge time for the pump. It is ready to fill immediately after the previous fill has been completed. PD Pump Fillers are ideal for liquids, and liquid type slurries with smaller particulates. Servo Positive Displacement Pumps are available in a variety of pump styles including Lobe or Bi wing rotor pumps, Sine pumps as well as peristaltic pumps for lab environments. They are available as single pump systems or multiple pump systems There are many applications for these machines, and they are commonly used as depositors applying spot deposits on dough sheet lines, or ribbon stripers to apply fruit slurry stripes on dough sheeters. They are also used in conjunction with a conveyor line as liquid or sauce fillers on in-line bottle filling systems with a conveyor. Volumetric Technologies Servo Positive Displacement Pump Fillers / Depositors are the perfect choice for filling and depositing a wide variety of products. If your products are thick or thin, with or without solids, hot fill or cold fill. No matter what your filling challenge might be, Volumetric Technologies PD Pump Fillers / Depositors will exceed your demanding requirements. These versatile machines can be used as a standalone machine in a semi automatic fashion where the operator places a container and then uses a foot pedal to make the deposit, or on a high capacity line, they can be used in a variety of automated applications like In-line Filling Systems, horizontal form fill and seal lines, vertical form fill and seal application as well as dough sheeters and cup filling lines. Volumetric Technologies Piston Filler / Depositors are ideal for use with Horizontal form fill and seal machine applications. They excel at depositing, dosing or spreading BBQ Sauce onto ribs, or depositing marinades and sauces onto your value added fish, meat and poultry products. 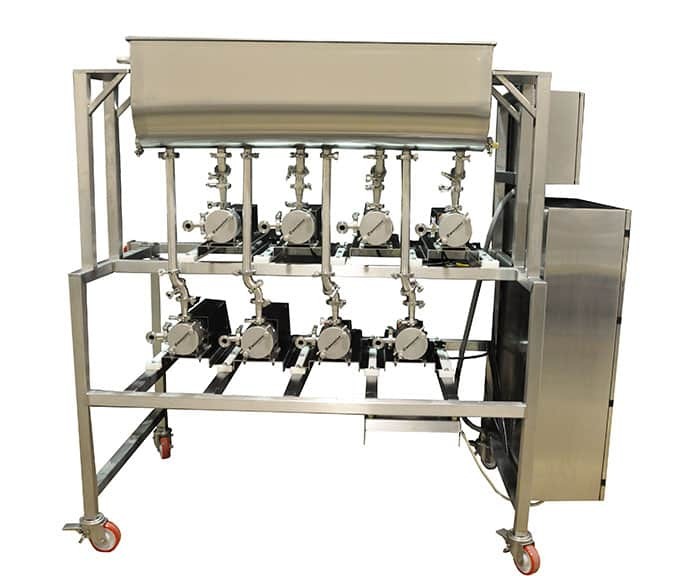 Volumetric Technologies Positive Displacement Pump Fillers / Depositors are ideal for use with Vertical Form fill and seal machines “VFFS” They are excellent at filling sauces and liquids into pouches on VFFS machines. For increased yield, we can get feedback from a check weigh system and then feed the scale information into our servo control system which will automatically adjust the Fillers / Depositors with information provided. With this scale feedback, the fillers will automatically and instantaneously adjust when product density changes to automatically increase your yields without operator intervention. Servo PD Pump Fillers are great for pie fillings such as small berry, pecan and pumpkin and any other fillings with small particulates. Our PD Pump Fillers great for spot depositing various products onto dough sheet lines. They are great for making items like turnovers, and strudels. Everything from apple filling, chocolate filling, cherry and mixed berry fillings can be deposited quickly and cleanly onto your dough sheet line. There are many benefits of Servo controlling a Positive Displacement Pump. It is not only weight accuracy, but profiling the fill speed for optimization.They are very useful in applications when you are spreading a sauce across a product for even coverage, or filling containers where the necks are narrow at the top. Servo control allows you to change the fill speeds during the duration of the fill.